What do soup and zombies have in common? Two things: pumpkins and innovation. In last year’s Halloween post, I cautioned that “Change Can Be Scary” but it is sometimes necessary to embrace innovation in order to move your mission forward. This year as I planned a Halloween post, I stumbled on two examples of organizations that have found innovative ways to raise awareness and funds for their causes (and both involved pumpkins or other squash-type vegetables). One is a New York institution that is reinventing itself through zombies and the other is a coalition of Canadians “trying to save the land that feeds us” with soup. While looking for Halloween images, a wonderful photo posted on John Haydon’s Inbound Zombie Facebook page led me to an inspirational story about an event at the New York Botanical Garden held last year - Zombies in the Garden. At the event, sculptor Ray Villafane carved two of the world’s largest pumpkins so that they appeared as if life-sized zombies were rising out of these enormous pumpkins (see the photo above). The event itself was an ingenious way of attracting a new audience to the Botanical Gardens and putting a fresh, current face on this organization. 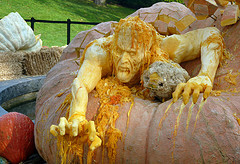 In addition, as a post by WebProNews suggests, Zombie Pumpkins Make for Awesome Web Content . Not only did the event draw attention and participation, but it has lived on through the photos and video on their website (time-lapse photography of the pumpkin sculpture process). These will live forever online. The event was held in a park on a sunny afternoon where participants could enjoy the various soup creations offered by more than 200 of Canada’s top chefs and an afternoon of music from a wide range of performers, including Jim Cuddy, Jesse Cook and many other talented musicians. Ok, so I have to admit that I didn’t see any pumpkin soup, but there was certainly lots of squash and other tasty vegetables and ingredients in the 80+ soup booths. At any rate, this unique event is an innovative way of having the participants and the community at large learn experientially. After all, the soups and breads we enjoyed were made from the very produce that is in danger of being destroyed if the mega-quarry project is approved. It made the thousands who attended stop and think about where their food comes from and what’s at risk if we allow our environment to change. These are only two isolated examples of how organizations can find innovative ways to raise awareness and reinvigorate support for a non-profit and/or a cause. It doesn’t have to be scary - it can be fun. Thanks for the Facebook Page love! You're welcome - great image of a great event.